As unplowed roads during last week's snowstorm in New Jersey were causing thousands of accidents and commuters were stranded Gov. Phil Murphy was eating dinner at a four-star restaurant with his wife. Last Thursday's snowstorm caused more than 1,000 accidents and over 1,900 motorists were stranded and had to be rescued. Even two high-level state officials were in car accidents the governor announced the day after the storm. While the storm was wreaking havoc and endangering lives, Murphy and his wife dined at Nicholas, an upscale restaurant in Middletown, reported NorthJersey.com. The restaurant is minutes from the governor's multi-million-dollar home on the Navesink River. While he was dining, commuters were enduring hellish road conditions that in some cases took them 12 hours or more to get home. The Port Authority Bus Terminal was essentially shut down, and many motorists abandoned their vehicles on the side of the roads. Some students had to sleep at school in West Orange because their buses couldn't reach them. A spokesman for the governor said he ate dinner near his home after "being stuck on the road for several hours during the storm" and "was on the phone helping to coordinate the storm response throughout dinner." Some took to Twitter to criticize the governor: "Any other governor would have still been at the command center and had pizza brought in for everyone there. Murphy is an out of touch Wall Street exec so instead he's dining at an expensive restaurant while too many people were still stuck on the roads and couldn't eat at all," read one tweet. Another wrote: "Let them eat cake while I eat at a fancy restaurant. Governor Murphy is an incompetent, elitist, lazy snob!" 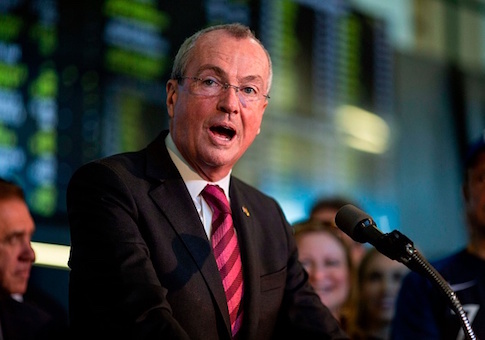 Murphy blamed the forecasters for the storm and on his call in radio show yesterday he did not apologize for the state's response but said, "My message to everybody is: We have to do better, we must do better, and we will do better—no matter what the circumstances." This entry was posted in Issues and tagged New Jersey. Bookmark the permalink.